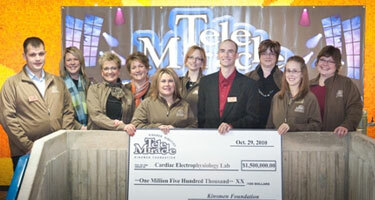 The Kinsmen Telemiracle Foundation has given from the heart, for the heart. Its gift of $1.5 million for cardiac electrophysiology has helped prolong and save lives across Saskatchewan. In honour of their generosity, we named the Cardiac EP Lab at RUH the Kinsmen Telemiracle Foundation Electrophysiology Laboratory. Thank you from the bottom of our hearts! “The Kinsmen Foundation is pleased to work with RUH Foundation to bring this gift to Saskatchewan’s cardiac patients. No longer will they need to seek treatment out of province—or worse, go untreated,” says Jake Porter, Kinsmen Telemiracle Foundation Chair. In more than 20 years, the Kinsmen Telemiracle Foundation has donated $2.5 million for healthcare priorities at RUH.